I thought this might interest some X1 Carbon users. 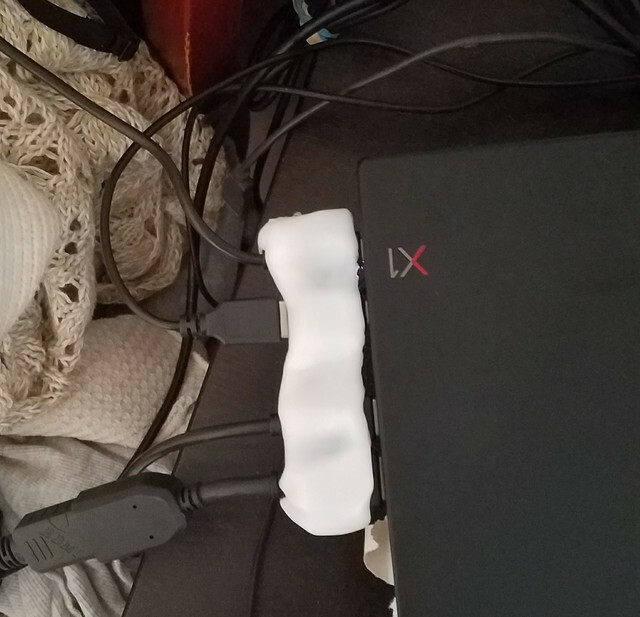 A few weeks ago picked up the X1 Carbon 6th Gen from Costco, and after trying various USB-C docks for pass-through charging, USB mouse/keyboard, HDMI, etc. ($30-60 each on Amazon), I find them all VERY wanting. Most get pretty hot, some tax the computer with fan constantly running, and ALL have occasional lag on a USB mouse. And the official Lenovo dock is like $300....so yeah nope. So I decided to make my own "dock" with Thermoplastic Pellets that melt at 140F in water and you can mold into whatever you want, and then it dries hard. There are a bunch of these on Amazon - I got 22 oz. of pellets - you could easily use 5 oz. for this solution. I had a short usb extension and short hdmi extension lying around, and bought a usb-c to usb-3-female adapter. All that is held together with the thermoplastic, which I molded around the connections while plugged in. Works like a charm so far (plastic dries very hard). Also leaves USB-3 on the right side available for external HD or whatever. (And you don't need to use HDMI and usb extensions....could just go direct to actual cord to each peripheral, but I had them so why not go for the extra flexibility). I'll probably make another one for work and continue to enjoy the benefits of directly plugging in to dedicated ports instead of giving those USB-C connections such a workout. Maybe someone will come up with a decent 3rd party dock that takes advantage of both USB-C Thunderbolt connections, but until then, I'll be rolling with this. 1. Available in both silver and black. Does anyone know off hand which SSD will work/fit the 6th Gen X1C? I'm looking to buy a 1tb samsung SSD.